Recently we shared preliminary details about Dapper Day coming to Walt Disney World and Disneyland. As promised, today we want to share some videos from last year, and some ideas on what to wear. DapperDay.com has a beautiful inspiration wall full of attire, hair style, and makeup ideas. Check out this Pinterest board from my friend Sarah Norris for even more great ideas. Sarah Katz-Scher has a public album of photos from last year that you can check out here. ThisFloridaLife.com posted an awesome blog about her feelings before the event, and some great photos of her adventures from the day of. I loved seeing photos and reading her take on the Walt Disney World version of the event. Check out this video we made from a previous Dapper Day at Walt Disney World! You will notice there are people of all ages attending. It’s not just for the young – but also the young-at-heart! Don’t take away my M.M.Y!! I was hearing rumors about Disney taking away ” The Magic, Memories, and You” which is my favorite show! “Celebrate the Magic,” a new nightly projection show on Cinderella Castle, will debut at Magic Kingdom Park in mid-November. “Celebrate the Magic” will incorporate favorite elements from “The Magic, The Memories and You!” with all-new music, storytelling and special effects. “The Magic, The Memories and You!,” will be presented for the last time on Monday, September 3, 2012 at both Magic Kingdom Park and Disneyland Park. SO, to me, I think they are actually just improving my favorite show – not just taking it away. Here is a pretty good 5 1/2 minute video that Disney released to help guests understand the differences between the quick, basic, and deluxe dining plans. Prices are not included but it helps with understanding why some people choose which dining plan is best for them. Remember the Disney dining plan is exclusively available to guests staying in Disney resorts. The Disney Dining Plan has become a Guest favorite to include as part of Magic Your Way Vacation Packages. 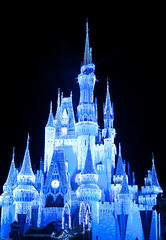 The Disney Dining Plan (DDP) for 2013 mirrors the 2012 program, with a new option for table-service restaurants to offer menu add-ons and prix-fixe menus. • Prix-fixe menu: Table-service restaurants may offer a separate prix-fixe menu that is available for a retail price. DDP Guests can choose this option with payment of a surcharge in addition to the table-service entitlement redemption. Separate surcharges for Disney Dining Plan Guests and Deluxe, Premium, and Platinum Dine Plan Guests will be noted on menus. • For restaurants that offer only a prix-fixe menu (such as Cinderella’s Royal Table) or have a prix-fixe menu included on their regular a la carte menu (such as Captain’s Grille): the prix-fixe menu is fully covered by the required DDP meal entitlements. • Menu add-ons: Table-service restaurants may offer menu add-ons, the ability to add another protein component to their entrée selection (e.g., option to add sea scallops to entrée). This option will be listed on the menu and requires payment of a surcharge by Guests who choose this option. DDP Guests can choose the menu add-on with payment of the surcharge in addition to the table-service entitlement redemption. • Be Our Guest Restaurant: Be Our Guest Restaurant at the Magic Kingdom Park offers fast casual service for lunch (requires one quick-service entitlement); however, for dinner, it operates as a table-service restaurant (requires one table-service entitlement). 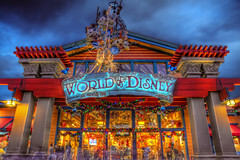 • Participating locations: Most Walt Disney World Resort theme park, resort hotel, Disney water park, EPSN Wide World of Sports Complex, and the Downtown Disney Area restaurant locations accept the Disney Dining Plan, including Operating Participants. • Refillable Mug: All Disney Dining Plan packages include a Resort Refillable Drink Mug allowing Guest to refill at Quick Service locations and select Merchandise Shops at the Walt Disney World Resort Hotel at which they are staying and throughout the length of their current stay. • Dining reservations for table-service restaurants can be made in advance or cancelled online at http://www.disneyworld.com/dining. Guests can also make or cancel a reservation by visiting any Walt Disney World Resort Hotel Front Desk, Concierge or Guest Relations, by calling 407-WDW-DINE, or by pressing 55 from any house phone.